Hurrying down the footpath through Sydney's energetic CBD with my weekender bag in hand and a skip in my step, I noticed dark ominous storm clouds high above me. The electricity in the air felt like a hot afternoon in summer - only it was autumn and the rain clouds weren't about to dampen my spirit. We almost walked past the entrance on the street if it hadn't been for a bell boy dressed in an electric blue tee shirt, butlers cap, black pants and braces. Stopping briefly, he warmly asked "are you looking for reception?" I nodded my intent and he guided us through the ground floor foyer as we awaited the elevator to arrive. "Enjoy the music on the ride up," he said. I looked at my other half quizzingly but heard a light 'ding' announcing the arrival of the elevator so we didn't have time to ask. Stepping into the lift, I looked up and around wondering what was about to happen. As soon as the door closed we could hear "Just the two of us" by Bill Whithers. Well played, well played. When the elevator doors opened we were affronted with one of the most impossibly intrepid looking hotel foyers I've seen in a long time. I had heard QT Hotels were very focussed on the detail and art, but seeing it first hand was something else. Walking up to reception, we were welcomed by the receptionist who looked after our check-in, giving us the ins and outs of the hotel. We were also given access to free Wi-Fi and movies. QT Sydney, we have arrived. So let me set you straight. 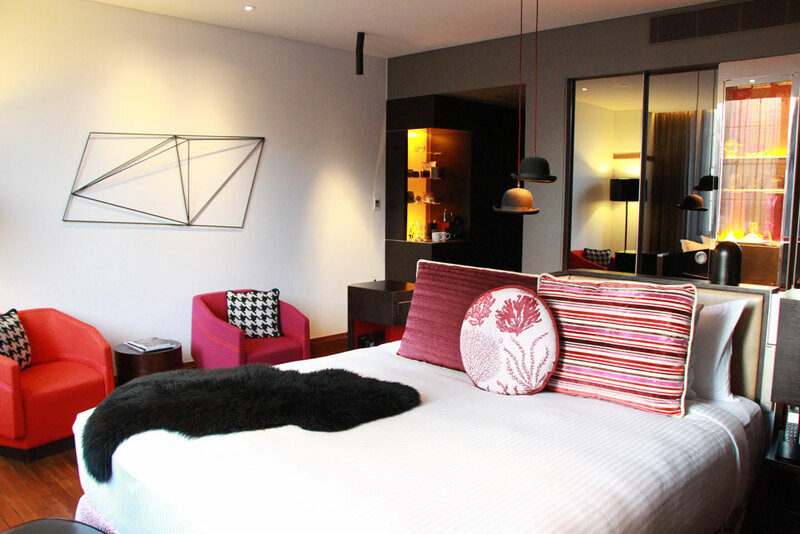 QT Sydney is a five star designer hotel in the heart of Sydney's CBD. The hotel features two sides - Gowings and State - and is home to 200 guest suites. With an eye for a modern design whilst reflective of the past, QT Sydney is housed within the historic Gowings and State theatre buildings with many of the original features still existent, such as the blend of Gothic, Art Deco and Italianate influenced architecture that form the impressive exterior of the building. The experience starts downstairs in the Parlour Lane, with first impressions being paramount to the hotel group. The quirky main foyer, the Gilt Lounge and the Gowings Bar & Grill offer a cooler than cool New York vibe which has recreated by the masters of the QT Hotels seamlessly. Taking a different elevator up to level eight, we walked down and around a carpeted timber floored hallway and opened the door to our suite using an electronic key. Straight away, I was feeling very curious. Another hallway beckoned me to walk down, however a mirrored side table caught my attention as did a personalised letter from the hotel manager which came in a QT paper bag and a gift - a white Lomography camera and film. Perfect for my travels, and so thoughtful! The guest suite was, put simply, luxury on steroids. Offering killers views over the gorgeous city, the room features creature comforts such as a huge king sized bed in the middle of the main room with luxurious bedding, a mini bar serving lolly pops and cocktails, a coffee machine, a huge plasma television, sofas to relax and unwind, and a study desk with all the mod cons. A large bathroom with indulgent oversized soaking tub for two people, a walk-in shower with a rain forest shower head, his and hers black plush bath robes, fluffy bath towels and luxury amenities. There is also 24 hour room service and the QT Concierge App offering everything that's hot in Sydney, be it the newest and hottest clubs and bars to one-off gigs and events. For those looking to explore the hotel, there is the spaQ - a luxurious day spa, the Gilt Lounge, a barber and private dining rooms for events. Choose your own adventure!